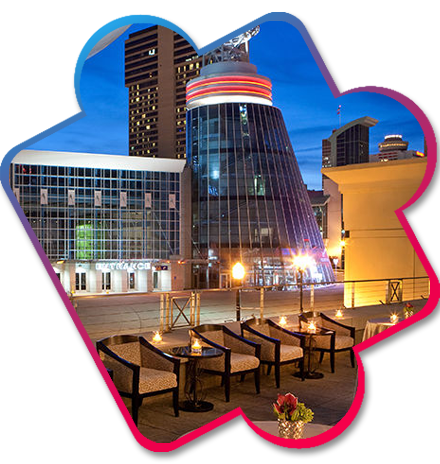 Conveniently located just steps from Lower Broadway and local attractions such as the Ryman Auditorium, Nissan Stadium, the Country Music Hall of Fame and Museum, and Bridgestone Arena, DoubeTree by Hilton Hotel Nashville Downtown is the ideal place to stay when visiting "Music City." Located ten miles from Nashville International Airport, they offer dining and and beverage options to satisfy every appetite. Enjoy a latte at the on-site Starbucks cafe. The distinctive Fourth & U restaurant and bar serves an array of urban dining options using local products maintaining Southern Traditions. Fourth & U features local musicians for your entertainment, and when the weather's right, enjoy the outdoor covered Patio 315, with large lawn games, fire pits and TVs, including a movie screen sized projection screen to watch games and events. Swim year-round in the indoor pool, or work out in the modern fitness center.